Maryanne Tipler ONZM has been recognised in the New Year's honours for her work in mathematics education. Caxton Educational Author Maryanne Tipler has been made an officer of the New Zealand Order of Merit for her contribution to mathematics education. 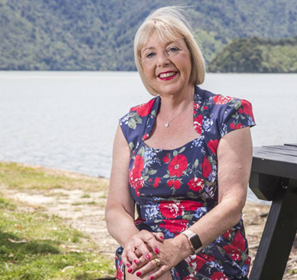 Maryanne, now living in the Marlborough Sounds, has been weaving Kiwi culture into textbooks and teacher support resources for 35 years. She has written 43 mathematics textbooks, 28 teacher files and nine homework books for primary, intermediate and secondary students, and sold 624,000 copies to at least 85 per cent of the country's schools. In short, she has produced more educational books and teacher resources than any other New Zealand author. Tipler said she had always been interested in how students learnt mathematics, and writing textbooks was a way to indulge her creative streak. "The first thing I wrote was a sort of individualised programme for low achievers that I was teaching at the time. My head of department, she started writing some secondary texts and she asked me to write with her. And after she retired probably 20 years ago, I continued writing. "I didn't really enjoy teaching, although I enjoyed teaching one-on-one or small groups, just not whole classes," she said. Following research in other countries, Tipler wrote for secondary students in New Zealand and Britain, before writing a series for underachievers in the UK, and later helped to set up a learning support service at Christchurch Polytechnic. Between 1994 and 2000, Tipler wrote the National Curriculum Mathematics primary series, trialling her ideas in schools and getting feedback from teachers. She had three children in primary school in Christchurch at the time, but realised primary teachers had a huge workload in adopting new curriculum areas. "Primary school teachers are not mathematicians, it's often not their strong suit, and they have to cover so many subjects. I think that's been the big success, they know the books cover the curriculum, all the research has already been done and it supports them to actually use the books effectively. "Being a mother has very much affected my work. It brought out my creative side even more and I could look at what they were struggling with grasping. And I could try things out with them. It definitely gives you a different perspective of how people learn." She moved to Wellington about 14 years ago, but bought a house in the Kenepuru Sound and moved there permanently about four years ago. "It's undiscovered paradise here," Tipler said, spending her Christmas beachside with her family. She was surprised and honoured to receive the award for her contribution to mathematics education, she said. "It's something you never think about, that you'll ever get that sort of acknowledgment. I just wanted to put something out that was useful to teachers and students. But it's nice to be acknowledged for your hard work and dedication." New Year Honours List 2019 in full, click here.